Can you confirm these amateur observations of Ctenotus inornatus? 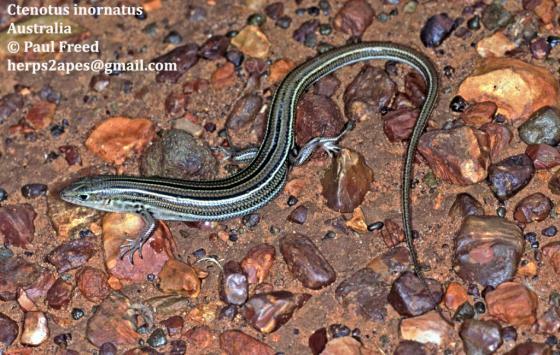 brachyonyx: Australia (New South Wales, South Australia, Victoria); Type locality: Annuello (34° 52’ S, 142° 49’ E), Vic. fallens: Australia (Western Australia); Type locality: 11 mi SSE of Kalbarri, in 27° 52’ S, 114° 12’ E, W. A.
helenae: Australia (Northern Territory,South Australia,Western Australia); Type locality: 24 mi ENE of Laverton, in 28° 31’ S, 122° 45’ E, W. A.
saxatilis: Australia (Northern Territory,South Australia,Western Australia); Type locality: 10 mi E of Tennant Creek, in 19° 40’ S, 134° 20’ E, N. T.
severus: Australia (Western Australia); Type locality: Galena, W. A. Diagnosis Diagnosis: in Rabosky et al. 2014. Comment Synonymy: Rabosky et al. (2014) found no genetic pattern that differentiated inornatus from helenae, saxatilis, serverus, fallens, or brachyonyx and thus synonymized them with inornatus. Lygosoma lesueurii concolor is a junior primary homonym of C. helenae, non Lygosoma (Rhodona) bips concolor WERNER 1910. Habitat: Triodia sandplains and flat rocky areas (Shea et al., 1988). Behavior: The species is active during the day and terrestrial (Shea et al. 1988). NCBI tax IDs: saxatilis = 480777 (Reptile Database ID = 12842), severus = 480783 (12848), helenae = 480746 (12802), fallens = 480739 (12794), brachyonyx = no NCBI (12778). Note that NCBI tax IDs are not preserved once species get synonymized. If any of them get revalidated they will get new NCBI IDs.